Firstly, apologies for not having written any book reviews for a while. I started a new job at the hospital I work at, and have been reading several relevant titles in the field of nurse education. Not the kind of books I normally review! So, in many ways this particular review offers the perfect anecdote to the books I've been working through of late. Following on from 'The World's Most Haunted Hospitals', author, paramedic and ghost-hunter Richard Estep teams up with Cami Andersen to deliver this comprehensive visit to the 'Haunt' at the abandoned Old Tooele Valley Hospital, located just outside Salt Lake City. 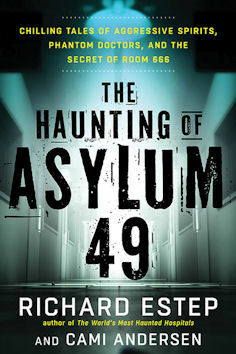 When I reviewed the previous book, I noted that 'Asylum 49', as the Haunt is now called, was the only location described that the author seemed to have personally investigated. In this new book, he elaborates on his experiences there, bringing in the deep background knowledge of his co-author whom, along with her husband, owns the old hospital site. As a result, this book is driven more by personal experience, and offers a detailed overview of the weird and wonderful events that regularly take place there. There's also a lot of fun in these pages! So, I rather like the idea of turning a creepy old institution into a Haunted House attraction. It sounds like Cami and her husband Kimm have done an incredible job here: The book sets out the attractions of the Haunt to Hallowe'en visitors in great detail. In many ways, the book could almost be a Programme Guide to the place. But the twist is that this commercialised Haunted House actually does seem to boast an active collection of ghosts and (non-surgical) spirits. For visitors to this paranormal lair, it must seem difficult to differentiate between the two. Where the tours of the Haunt feature numerous scary ambushes, often involving a team of heavily made-up volunteers, some of the encounters cannot be attributed to human activity alone. Sometimes, guests enter a different Twilight Zone altogether. Of course, one might readily argue that this is attributable to the power of suggestion. In many cases, that may indeed be so. But there have been enough bizarre encounters to merit further investigation by more seasoned, and often more sceptical, ghost-hunters. This is where Richard Estep, and his team of paranormal enthusiasts from Colorado, steps up. It's interesting to note, in this context, that Estep encountered little of interest on his first, off-season visit. It was when he returned to investigate during the 'active' Hallowe'en season that things really kicked off for him and his team. Visiting Asylum 49 during Hallowe'en 2015, his team measured, recorded, experimented and coerced the spirits of the place into action. Their results are fascinating, written up meticulously by Estep himself (often writing in the third person). Their approaches are often highly innovative, drawing upon the medical knowledge and experience of many of the members of their team to elicit a response from the ghosts of doctors, nurses and very ex-patients lurking on the gloomy wards of the old hospital. The way the hospital had been abandoned four years previously, as if overnight, gives the sense of an unloved environment from which the people who had worked in it for years couldn't wait to leave. the subsequent renovation of the building to turn the hospital into a 'haunted hospital' attraction may well have been the trigger for much of the paranormal activity recorded in Asylum 49. (A suggested area of research, which was not covered in the book, may be to seek out the experiences of medical, nursing and ancillary staff who had worked there when it was functioning as a hospital, to discover whether they had experienced any paranormal activity at that time). Evidence of this kind of activity takes the form of intelligent, responsive EVP in the area (p27). There are numerous sightings by the owners, visitors, ghost-hunters, staff, volunteers, contractors. Photos are described in the book (pp37-40) which can be accessed online at http://www.asylum49.com/Photos-1.html *. For the most part, these photos show little of any real evidence; taken out of context anyhow. The play of shadows on a wall may seem inconsequential in a single photo, but may be of great interest when changing in front of one's eyes at the time! Orbs are often droplets of water vapour or dust reflecting light from a camera flash, and so on. Then there are results from of use of Spirit boxes, the Ovilus, the Human Pendulum, and other questionable techniques. What is more profound in these accounts are the human experiences of ghosts. Sometimes, these ghosts seem to manifest physically, and actually exhibit palpable touch. Sometimes with a frightening degree of force! It is here where Asylum 49 becomes actually scary. The people who have become acquainted with this place have amassed a roll-call of disincarnate personalities inhabiting the building. Each ghost has its own recognisable pattern of haunting; some passive, others more disturbing. Perhaps there is more than a little imagination feeding into this ghostly menagerie, creating a tableau which provides the Haunt with its own character and narrative. This is the danger of mixing commercial interests with a more scientific framework of investigation. Despite these concerns, people have clearly been scared by events in the old hospital on many occasions, and several of the stories described in this book defy rational explanation. As a reader, I didn't find it too difficult to differentiate between the publicity-seeking and the genuine incident of interest, which is to the authors' credit. Like I said before, much of this book is fun, characterising the experience of general visitors to the Haunt, and what they might expect. Heck, I'd go there! Generally, there's a fair balance of interpretation of the events described in the book. The authors show the ability to step back from it all with a degree of objectivity, looking for simple, rational explanations in the first instance. "...The entire team was working long days and very late nights investigating the former hospital. They were running on a decidedly less-than-healthy diet of energy drinks and junk food, which was hardly optimal when it came to keeping their nerves calm and their minds relaxed. Nocturnal ghost-hunters of all levels of experience would do well to bear these wise thoughts in mind! The ethics of publicising information about the ghostly denizens of the hospital is also considered - relatives of those who had tragically dies in these walls still live in the local community. One situation described in the book clearly sets out the dangers, as well as the profound nature of what might be taking place here (chapter 10). There is some excellent story-telling in the book, my favourite being that of the shadow child and the flashlight (p120-2). Generally, the book is well written, and well presented. The quirkiness of its content is intelligent and thought-provoking, and I would heartily recommend it. Subtitled: "Chilling Tales of Aggressive Spirits, Phantom Doctors, and the Secret of Room 666"